The consequences of a primary focus on shareholders over the last few decades has emphasized that that a new model of value creation is necessary. Today's economy demands organizations that create value, not only for shareholders but also for customers, employees, leaders and society. Businesses that face up to this challenge by focusing on all the stakeholders involved will be far more successful in the long term than those driven purely by seeking to deliver the maximum return on shareholder investment. 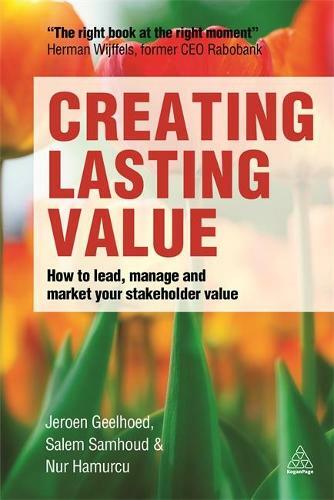 Creating Lasting Value shows readers how to achieve lasting results by channeling efforts into three key areas. It demonstrates how to lead the value, manage the value, and market the value. The successful organizations of the future will be those that can put these principles into practice: this book shows you how. "This book is about the core of entrepreneurship! Creating Lasting Value shows how important it is to create value for customers, employees, shareholders and society. The underlying philosophy in the book-creating breakthroughs by inspiring and creating people-is exactly what it's all about in these times. This book shows how exciting it is to create a brighter world with business, and realizes how to realize this. I admire the link between business practice and academic wisdom. Highly recommended, also for academic programs!" --Sascha Kraus "University of Liechtenstein & University of St. Gallen "
"The authors of this timely book have a great advantage over most other people who write about creating value: they've done it. Their firm, &samhoud, has accomplished what all businesses must strive for in the 21st century-creating a stimulating place to work, providing superb customer service, making important contributions to society, and earning the profits that make it all possible. Creating Lasting Value shows how you can do it too." --Bo Burlingham "Editor-at-Large of "Inc." magazine "
"Creating Lasting Value will change the course of how companies think and act. Example after example inspire you to discover your vision, build a business model that creates value for all stakeholders and realize it with full swing. Companies can do good and do well. Every company should." --Geanne van Arkel "Sustainable Business Development Director at Interface "
"If you invest in your employees, they will serve your customers better. That will lead to better results. This philosophy shapes the approach presented in the book Creating Lasting Value. And I love it!" --Paul Spiegelman "Chief Culture Officer at Stericycle "